Abu Dhabi aims to become a leader in the global halal tourism market and gain a greater share of the global market which is estimated to be worth $140 billion, set to rise to $192 billion by 2020, said a top official. “It is incumbent on us to find new source markets, stimulate demand, and introduce new marketing concepts to inspire first time visitors and build loyalty to encourage our guests to return, and we believe the halal Tourism niche is one which can achieve this,” added Sultan Al Dhaheri, acting executive director Tourism at Abu Dhabi Tourism & Culture Authority (TCA Abu Dhabi). He was speaking at Abu Dhabi’s first halal Tourism Workshop, event organiser for the upcoming World Halal Travel Summit. Organised by TCA Abu Dhabi, the workshop brought together Abu Dhabi’s hospitality industry to hear how they can gain a slice of the booming international halal travel trade market by making small adjustments to their marketing and sales activities. “By galvanising the emirate’s hospitality industry to embrace the sector’s travel patterns, habits and aspirations, we believe we can carve out a niche and become the regional leader in halal tourism and attract Muslim travellers from Europe and beyond the GCC and Arab speaking world,” Al Dhaheri said. In October, the emirate will play host to the first World halal Travel Summit & Exhibition (WHTS15), the largest showcase of halal travel and tourism solutions with support from Abu Dhabi Convention Bureau, a division of TCA Abu Dhabi. “The World halal Travel Summit is an opportunity for these businesses to join ministerial debates and meet with 6,000 international delegates and visitors through a peer-to-peer business platform to shape the future halal tourism conversation and capitalise on commercial opportunities,” he added. Research undertaken by Crescent Rating, a global resource in Islamic travel, indicates that 25 per cent of the top 20 growth countries in tourism expenditure in the last 10 years have been from the OIC countries. 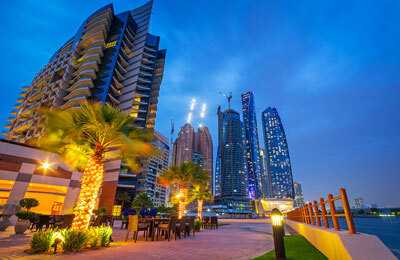 “The emirate’s hospitality industry also has a strategic advantage to benefit from the growing trend of twin-centre city break and beach holidays where family groups can combine cultural sightseeing and family leisure holiday in a single trip, and from providing halal stopover options for Muslim travellers to the east or west,” he added. The halal tourism sector is tailored around the travel needs of Muslim and non-Muslim tourists who predominately seek a family friendly environment and halal tourists are proven to travel in larger family groups, stay for a longer period and ultimately spend more than many other niche sectors. TCA Abu Dhabi recently launched a series of multiple self-guided halal holiday ideas and will further promote the sector across its network of 11 overseas offices to develop the visitor opportunities for this sector.